a whole lot tougher. With promotion playoffs within reach this month, The Cosmo League's 2nd Division goes into overdrive in Week 20! The brawl for 2nd in the North! With KidSamba set to take top spot, FC Spring Valley have arguably their most challenging match of the season. With a loss to Malatyaspor, Spring Valley goes to 3rd. Spring Valley win? They reclaim top spot in the North and can head to D2 Championship playoffs. A win for Malatyaspor USA will send them into 2nd place and into D2 Championship playoff territory. The Turkish debutants have had a rollercoaster of a season, starting out with a bang, going into a 6-game winning streak through September and October 2017 before drawing to Manhattan Celtic. They surely have their eyes locked on getting a top 3 finish to the season. FC Spring Valley have only been around as a Cosmopolitan side since 2014. They have been flying compared to their last season. They finished 5th in the Northern 2nd Division with a record of 7 wins, 3 draws, 6 losses and the most goals in the North with 51 scored. Currently, they are in 2nd place with 31 points, just a single point below 1st place KidSuper Samba AC on 32. This win against Malatyaspor USA will be their last chance to take a top spot and be assured a place in the D2 Championship playoff final. Malatyaspor Coach Serkan Mutlu has the likes of Engin Baytar, Ismail Gul and others to score. Baytar has had a great season in the Cosmo League as joint 3rd best goalscorer in the Northern 2nd Division, along with KidSuper's Alhoussain Bah. Spring Valley's dynamic duo of Roberto Garcia and Omar Aragon are the players in form for the club and will look to be the creative outlet for the starting eleven to nab a win at the expense of both Malatyaspor and KidSuper. Malatyaspor will play FC Spring Valley at the Nardi Soccer Complex in Thiells, NY with kickoff starting at 11:00am EST this Sunday, May 20th. Celtic clash at Randall's against Brishna! It's 3rd versus 5th in the North with Brishna squaring up to Manhattan Celtic. 4th place Brishna had a positive campaign this season but couldn't keep form. Unlucky not to make promotion to D1 last season after they finished 2nd in the North, they now have 2 matches left to make a top half push as they face Manhattan Celtic next and will play Sporting South Bronx in the last game of the season. Celtic proved to be one of the more exciting teams to watch this season but couldn't dominate opposition. Forwards Marco Charnas, Jaime Reilly and Raul Zuniga were just some of the club's best performers this season scoring a combined 23 goals among them. Celtic Coach Matthew Kane has seen both confident victories and regretable losses but are looking to end the season with wins regardless. Manhattan Celtic versus Brishna takes place at Randall’s Island Field #70. Kickoff is at 9:00pm EST this Sunday. 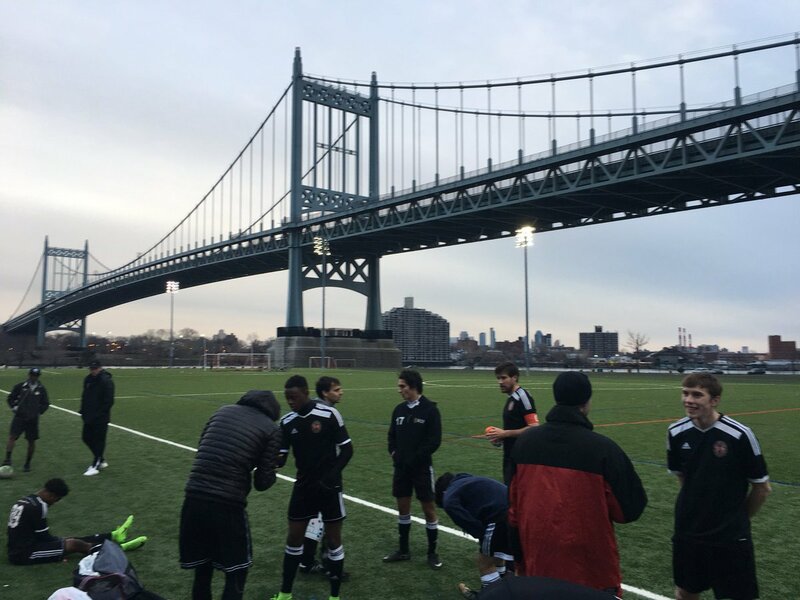 Randall's Island is the stage for the Northern encounter between 2nd place Hoboken FC 1912 and leaders Polonia Gwardia NY. 12 wins in 15 matches is quite an achievement for a Cosmo League D2 side. Polonia Gwardia NY are aware of their record of 12, 2 and 1 in 15 matches and are fighting to return to Division 1 as quickly as they entered the 2nd Division. They are dangerous in front of goal, scoring 3 goals a game on average and will not go easy on Hoboken, who are pushing the Polish to the edge. However, Hoboken FC are also going into the match with some confidence. They have some of the most feared strikers in the league, conceded the 2nd least amount of goals in the entire 2nd Division and carry just as an impressive record as their opposition at 11 wins, 3 ties and a single loss. With their reserve side spectacularly winning the 2nd Reserve Division undefeated, the first team will have to learn by example on how to win big matches with this being one of their biggest. Hoboken FC will play Polonia Gwardia at Randall's Island Field #75. Kickoff is at 12:00pm EST on Sunday, May 20th. Stal Mielec will face visitors FC Japan at the Bushwick Inlet this Sunday. FC Japan play their last game of the season at the Bushwich Inlet in Brooklyn against Stal Mielec NY. The Japanese club has kept their "never-say-die" attitude all throughout the season and are steadfast going into their match against Mielec with the same vibe. Stal Mielec NY come back from a disappointing 6-1 loss to Polish rivals Polonia Gwardia NY and hoping to dispatch a patchy FC Japan side with a win on their last matchday of the season. A win wouldn't be unrealistic as they have been on the end of some high-scoring victories such as their 7-1 demolishing of Panatha USA both home AND away this season and beating surprise package Williamsburg International 5-3 at home. Kickoff is at 2:00pm EST at the Bushwick Inlet this Sunday. KidSuper Samba AC received a 3-0 win due to automatic forfeit from Bronx Supreme FC and will not play this weekend. Last Place with nothing to Lose! Panathinakos USA aim to close the season with a win against 5th place Club Deportivo Iberia. Some of the league's most entertaining teams this season has produced big results and goes without saying. Deportivo sit 5th in the South and have scored 2 goals a game on average but haven't maintain a top-half breakthrough yet. But with Coach Carlos Vásquez, it's all about progression from the end of this season onwards. When asked about the future of Club Deportivo Iberia, his answer was brief. "As for the future, we plan to continue striving to reach the 1st division. We spent about 10 years in the 1st division and look forward to getting there again." Panathinakos USA will be aim for nothing but 3 points come this Sunday and will want to reach away from relegation spots. Currently at rock bottom with 7 points in 14 matches, they will build from within to play better come next season or bust. The kickoff for Club Deportivo Iberia against Panathinakos USA is at 4:00pm EST at Randall’s Island Field #74 this Sunday. The Rumble in the Bronx! Central Park's Reds will travel to the Bronx to face Sporting South at Soundview Park. Central Park Rangers Reds currently take their spot in 5th in the Northern Division comfortably, clearly knowing how to win as opposed to their counterparts in the top flight. The Cosmopolitan Soccer League's 1st Division has Central Park Rangers Whites in 7th place with a record of 2 wins, 6 draws and 9 losses all season with a game in hand. In comparison to the Reds in the 2nd Division who have collected a record of 8 wins and 6 losses in 14 matches so far ths season, it should be something that CPR Manager Blake Berg should be a touch concerned. Sporting South Bronx are not looking to go down without a fight however. With both encounters against CPR Reds and Brishna waiting in the wings this month, they are focused on improving game by game and aiming for promotion next season. Division 1 is always within reach for Coach Ed Romero's squad. "It’s always about D1. We want to get there. Just getting there would be a great achievement for a working class club like Sporting." 7:45pm EST is the scheduled kickoff for Central Park Rangers Reds versus Sporting South Bronx at Soundview Park in the Bronx this Sunday. NYPD FC and Williamsburg International will not play this week as they have a BYE. NYPD will see their next game against Central Park Rangers Reds at Randall's Island Field #70 with kickoff at 9pm EST. Williamsburg International play thier last game of the season with Panathinakos USA at Randall's Island Field #70 with kickoff at 9pm EST.